At the start of the 2015-16 season, Jackets fans pegged next Tuesday’s matchup against the Duke Blue Devils as a signature game, a barometer of sorts for the team’s performance moving forward. Duke was coming off a season that ended with a national championship over formidable Wisconsin. Tech came up a mere six points short against the Blue Devils last season in the ferocious atmosphere of Cameron Indoor Stadium, offering a benchmark to compare this season’s contest. While it is not a real surprise to see the Jackets enter this game devoid of momentum — after all, Brian Gregory’s teams have rarely fared well against a difficult conference schedule — Coach Mike Krzyzewski’s Duke squad is facing a similar run of misfortune, leading up to what could be a pivotal game for both teams. The Blue Devils (15-5, 4-3 ACC) have played uncharacteristically poorly as of late, dropping four of their last five games. In the last two weeks, Duke has fallen from No. 9 in the Associated Press Poll to No. 24, suffering losses to Clemson, Notre Dame and Syracuse. The three losses came by an average of 3.7 points, each tougher to stomach than the last. Duke fans are unaccustomed to taking solace in moral victories. The team has been handicapped since rebound machine Amile Jefferson broke his foot in a mid-December practice; his presence inside has been sorely missed. Brandon Ingram and Grayson Allen have led the charge for the Blue Devils on offense, averaging 20.4 and 21.4 points per game, respectively. The defending national champions battled back against NC State (an 88-78 victory), but struggled in their 69-80 loss against No. 15 Miami. Junior Matt Jones commented on the Blue Devils’ recent lack of momentum after the former game, emphasizing that the Blue Devils “… realize as a team that [they]’re not going to just wake up and win,” courtesy of espn.com. The Blue Devils’ losing streak has loosened their grip on the eighth and final seed in the ACC tournament, and they march into McCamish Pavilion hoping to climb the ACC standings before the tourney begins in March. The team has yet to face the meat of its schedule; after games against Tech and NC State, they face No. 16 Louisville twice, along with No. 11 Virginia and No. 2 UNC. The path to resurrecting their season begins at McCamish Pavillion. Once again, Tech aims to play spoiler. The Jackets (12-8, 2-5 ACC) come into this weekend having dropped five of their last seven games, including a one-point heartbreaker against Virginia Tech and a four-point thriller against No. 16 Louisville, both at home. 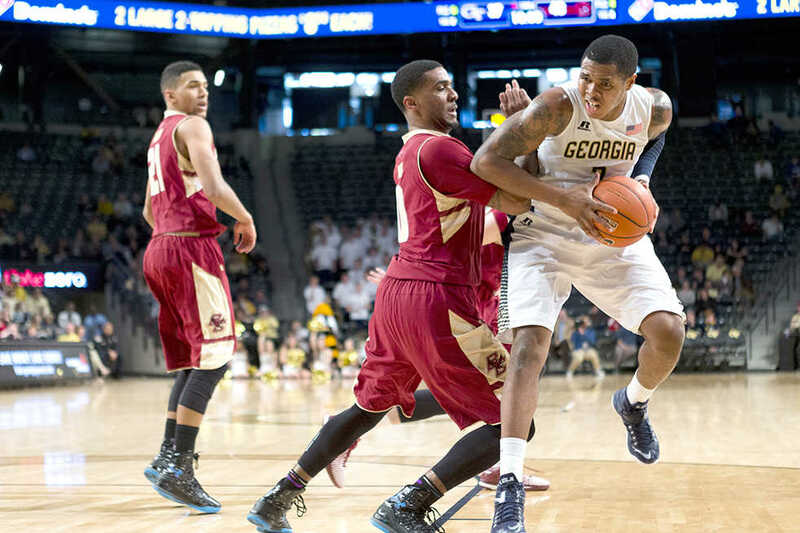 However, senior guard Marcus Georges-Hunt has been a light in the dark for the Jackets during the month of January, now averaging 15.8 points per game and making almost 45 percent of his shots after a 23-point outing against Louisville which saw him foul out on a controversial call with 1:01 remaining in the game. Despite the team’s progreess, there remains work to be done if Tech wants to shake things up in the ACC and compete in the NCAA tournament. Tech’s lone conference win was its major upset of then-No. 4 Virginia. The Jackets currently sit at No. 12 in the ACC, four spots out of a conference tournament berth. If Tech wants to appear in the NCAA tournament for the first time under Brian Gregory, it needs to start finishing games down the stretch, rather than letting sizable leads slip away at key moments as it has in all too many recent games. The clock is ticking on Tech’s season, despite a torrid start. With 11 games left to go before the ACC tournament, it is now or never for Gregory, Georges-Hunt and a Jackets team that will not likely be this close to contention for years to come.